Be prepared to be shocked, the Arctic is seriously likely to reach a record-breaking low extent this summer. 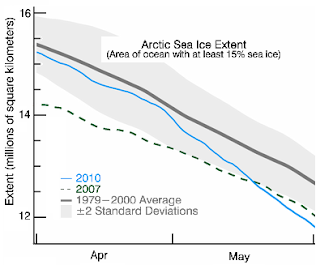 I thought I'd write a short blog on why; and why I think the arctic is in its death throws. This year's Arctic record low will be easy to understand. We're predicted to have a record-breaking ground and sea temperature; we've had record breaking increases in CO2 (3ppm in a year, during a recession I might add); the ice volume anomaly has already broken records by about 100% (compared with 2007). 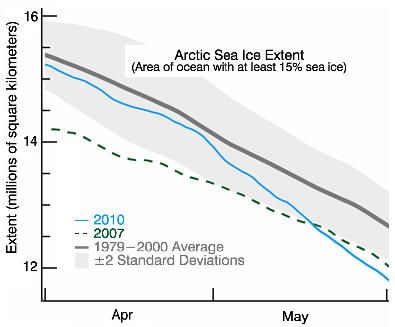 The ice-extent itself declined from a near 1979-2000 average in early April to below the record low for this time of the year (which occured in 2006) so if it tracks at the same rate it'll take until July at the earliest before 2007 catches up. However, it will almost certainly accelerate. So far so bad, but actually it's much worse. Climate Scientists have been predicting imminent new record lows since 2007, because the 2008 and onwards Winter ice has been thin and therefore prone to melting - so the ice extent over the past few years has been deceptive. In fact summer 2008 and 2009 were almost as bad as 2007 and it should have been newsworthy even though it wasn't terribly surprising. The real killer though isn't the thin ice, but that so much of the Arctic ice is no longer solid, but broken regions of ice held together by refreezing - rotten ice. There are numerous first hand reports confirming this; that is, detailed satellite picture analysis and fly overs. I think we should now consider the Arctic to really be basically a mass of loosely connected ice-floes primed to float south at the slightest provocation. This 'ice-mass' is moving quickly as some Arctic explorers recently found out. That's the problem - the Arctic ice no longer even needs to melt as such, it can just drift into oblivion. I thought I'd add a comment to my own post. Which predicts an essentially ice-free summer could occur as early as this year (where 'ice-free' means <20% of the average volume from 1979-2000).